LOUISVILLE, Ky. – No. 3 Women’s Basketball (12-0) travels to Lexington to face in-state rival Kentucky on Sunday at 3 p.m. ET. Louisville looks to make it two straight over the Wildcats following last year’s 69-67 overtime victory at the KFC Yum! Center. They also look to extend their second-best start in school history to 13 straight wins. In the Cards’ 95-56 win over Tennessee State on Tuesday, seven players scored in double figures (Asia Durr -12, Sam Fuehring – 12, Jazmine Jones – 12, Bionca Dunham – 11, Myisha Hines-Allen – 11, Kylee Shook – 11, Dana Evans – 10) and all seven players were within two points of each other. It marked the first time since Dec. 15, 2014 vs. Old Dominion that seven players have finished in double figures. All 10 active players scored for UofL. On the season, Louisville is shooting 50.4 percent (381-756) from the field, which ranks seventh in the nation and first in the ACC. Five times this season, and five of the last eight games, the Cards have shot above 50 percent – .528 vs. Oregon, .553 vs. Murray State, .523 vs. UT Martin, .563 vs. MTSU, .543 vs. TSU. The Cards boast a 90-1 record (.989) when shooting 50 percent or better from the field under head coach Jeff Walz (5-0 in 2017-18, 7-0 in 2016-17). 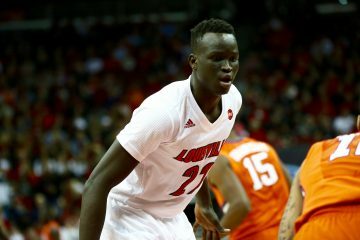 Louisville has three players that rank in the top eight in the ACC in field goal percentage (4. Fuehring, .609, 5. Jones, .589, 8. Hines-Allen, .560). Their average scoring margin is 29.1 points, which ranks sixth in the country and second in the ACC. Eight of their 12 wins have been by 22-plus points and 10 of 12 have been by 13 or more. Their 64-point win (115-51) over Murray State ranks as their sixth biggest win in program history. The 115 points are the most in program history. UofL scored 70-plus points in their first seven games, which tied the program record (1990-91), and have scored 70-plus in 11 of 12 games. Their record is 187-20 when surpassing the 70-point plateau under Walz. The Cardinals were 18-3 last season when reaching the mark and are 11-0 this year. With 84.4 points per game, the Cards rank 20th in the country and second in the ACC. Louisville ranks 19th in the country and second in the ACC, shooting 40.0 percent (80-200) from 3-point range. They have made at least five 3-pointers in other 11 of 12 games. Durr is shooting 46.1 percent (35-76) from 3-pt range, which ranks second in the ACC, and in the last two games, she has hit 7-of-8 from deep. Kentucky (8-3) opened the season with wins in their first six games, but they are just 2-3 in their last five. They’ve had a week off since dropping both games during their road trip to Florida (L, at Florida Gulf Coast, 70-64; L, at Miami, 65-54). Junior guard Maci Morris leads Kentucky in scoring with 15.8 points per game and with 30 3-pointers hit, while fellow junior Taylor Murray is averaging 12.3 points and 5.9 rebounds with a team-best 40 assists and 18 steals. Freshman Tatyana Wyatt is averaging 10.8 points and 4.8 rebounds per game. As a team, the Wildcats rank 16th in the country with just 12.5 turnovers a game. Their 474 total rebounds rank 19th and their 10.2 rebound margin ranks 25th. They are scoring 75.9 points per game, while giving up 59.9 points, and their 16.0 scoring margin ranks 44th. UofL is 17-34 all-time against Kentucky and 4-19 in Lexington. The Cards last win in Lexington was a 80-65 victory on Dec. 20, 2007. That was Walz’s first game against UK. Last year, UofL downed Kentucky, 69-67 in overtime, at the KFC Yum! Center on Dec. 4, 2016. Hines-Allen led the charge for the Cards with 26 points, while Durr added 15. The victory ended UK’s five-game winning streak against UofL. The Cards fell 72-54 on Dec. 10, 2015, their last time playing UK in Lexington. Overall, Walz is 4-6 against UofL and 1-4 in Lexington.